I was recently presented with a problem involving the original steel wheels and tires on my Spitfire. The problem was caused by one tire blowing the sidewall out (impact related). Unfortunately for me, it was a Yokohama A509 tire that is no longer made. Consequently, I was left with three nearly new tires, and no replacement option for the fourth. As always, I saw this as an 'opportunity to make lemonade out of lemons' and started considering my options, all of which are dictated by monetary restraints. I thought about buying two Yokohama AVS Intermediates, and running a pair of them with the A509's, however I was also aware that my stock steel wheels were bent and out of round. How should I proceed? When discussing this issue at a local LBC club gathering, a TR7 friend offered his older set of alloy wheels for a reasonable price. They would come complete with tires already mounted and bargain priced as well. This would solve my bent wheel problem as well as my need for tires and stay within my affordable money limits. I knew the wheels he was offering, liked the look, and agreed to purchase them. This is where the adventure begins. I had nothing wrong with my original wheel studs and lugs. However when attempting to bolt on the TR7 wheels, I couldn't use the original Spitfire lug nuts as they didn't match the TR7 wheels. I'll detail this problem more in a minute. The TR7 lug nuts were needed as they are matched with the wheel, and were a 12 mm x 1.5 lug which did not match the 3/8th wheel stud on the Spitfire. The difference between the wheel stud and nut on a TR7 wheel and the Spitfire wheel stud and nut is significant, not only in size, but function. Let's take a moment to discuss the difference between LUG-centric and HUB-centric wheels. Using lug nuts that are rounded at the inward point centers a lug-centric wheel when the taper mates with the counter-sunk taper of the wheel stud opening. Lug-centric wheel studs and nuts is the configuration the Spitfire uses. Wheels that are centered by the open center hole on the wheel's hub are hub-centric. This is the method that the TR7 uses to mount and center its wheels. The hub extends, in most cases, into the open hole on the wheel center and matches it's opening. Additionally, the lug nuts are also matched with the wheels, as the lug nuts are usually a longer cylinder shape that inserts straight through the matching lug opening. OK, since I was obviously going to replace the lug nuts, why not consider replacing the wheel studs as well? 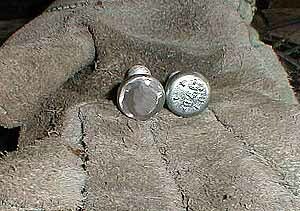 Better yet, why not make them a more standard, and somewhat stronger 7/16th inch stud with a 20 thread? The end result allows me to use the TR7 wheels and easily find a lug nut that matches as a larger selection exists. At this time I recalled seeing one Spitfire related website that documented this alteration. I used this information as my starting point, and now that my project is completed, this is what I can share with others. 1. I am not a mechanical genius, and my methods certainly fall within ìShadetree Mechanicî standards. 2. I do not hold myself out as an expert, your results may vary, proceed at your own discretion. After putting my car on jack stands, and removing the old wheels, the first major step in this project is to remove the original wheel studs. I discovered that this could be accomplished without removing any major moving suspension parts. The front studs are easily removed and the new studs installed without dismounting anything. The rear studs can only be removed and reinstalled with the brake drum off. See your manual for removing the brake drum. 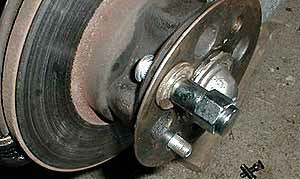 After the brake drum is off, then the hub can be rotated so the stud can be positioned into an open area avoiding the brake cylinder and springs. I was able to remove one hub, however, which made this process a bit easier. 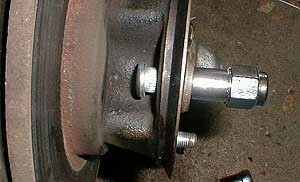 It is possible, as mentioned above, to complete the conversion without removing the hub. Removing the studs requires you to use your own judgment here regarding the proper method. My Shadetree method was to put some hardwood against the end of the stud and then proceed to hammer them out after a presoak of WD-40. Keep in mind, WD-40 and brake pads/rotors do NOT co-exist well for obvious reasons, be careful. I had no difficulty removing any of the studs in this manner, however your results may vary as I mentioned before. Installing the new studs takes patience, and again, the method I used may be questioned by some. I elected to pull the lug through the hub using a washer(s) and a new lug nut. On the front hubs I inserted the new stud to the shoulder where the knurls start to engage. I then positioned a washer over the end of the stud, tightened the lug nut finger tight, and then slowly tightened the lug nut while checking the head in back to ensure it was pulled in straight. Note: you will want the washer to be a matching 7/16th washer to assist with aligning the stud. (see Pictures below) This method worked for me, consistently with all sixteen studs. The rear studs require a bit of alteration to ensure the stud head does not come in contact with the rubber boot of the brake cylinder. I choose to defeat this problem by inserting the threaded part of the stud into a junk piece of radiator hose with an inside diameter of 1/2 inch that I had recently discarded. I could then hold the stud while I reduced the height of the stud head on my bench grinder. (The rubber hose also kept me from burning my fingers on the heated up stud as well as giving me some additional distance between my knuckles and the grinding wheel.) The shape of the head resembles a mushroom. The outer edge or dome of the stud is the part to pay attention to. I merely removed some height, and then rounded over the edge a bit to provide the proper clearance. Installation of the rear studs is the same as the front studs. Inserted from the rear, washers added, the lug nuts pulled them in square. Spin the hub and ensure clearance between the stud and rubber boot. Additionally, after the job is completed and the wheels have been mounted, please remember to once again remove the wheel and check clearance once again by removing the brake drum and checking the brake cylinder boot for rubbing. There are a few items to note with this project. If you are not comfortable grinding on the stud heads and feel the studs will be weakened by doing so, then don't do this project. Also of note, the heads of the studs have a 90-degree angle between threads and base of the head. The originals are tapered at 45 degrees, which fit into the beveled hub in a countersink position more securely. With that understanding, use your own judgment. Lastly, if you have been told that TR7 wheels are a straight bolt on, you have been misinformed. IF... the wheel has the same backspace or offset as your original, then overcoming the hub-centric vs. lug-centric obstacle is the only hurdle. After my stud replacement, I mounted my new wheels and promptly discovered the TR7 wheels have a different offset and actually increase the width of track. Not only that, but the 185/70 tires were 'too tall' and with the additional change in offset I have significant wheel rub. Enough that the car wasn't able to be driven until I resolved that problem, which was quickly rectified by mounting some 185/60 size tires. I did have to roll the inner front wheel wells just a tad. I'm very pleased and personally think the end result is worth the effort.